October 10, 2013 | David S. Maldow, Esq. 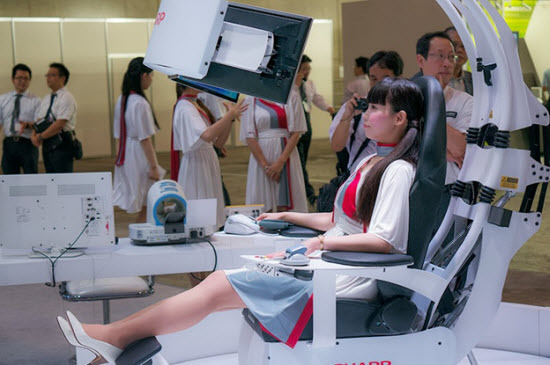 DigInfo recently posted a cool video (see below) about Sharp's Telehealth Chair. The solution is a very interesting take on telemedicine. While there is a lot to like about it, they had me at the fact that it is a proactive approach to healthcare. Healthcare is often focused on what to do after you get sick, but it is clearly preferable to stay healthy in the first place. The Sharp solution is designed to help us do just that. The device itself isn't about any revolutionary technology, it is just a clever packaging of existing tools, such as automated blood pressure, pulse, and temperature sensors. The real key is the cloud service behind it, which can store and track a user's stats over time. If there is a sudden change, a user can address it before they would have otherwise noticed any symptoms. In the future, Sharp may enable videoconferencing on the device, and connect users with actual physicians, to potentially offer real time diagnoses and treatment. The eagle eyes at Ubergizmo�noted that the Sharp solution is based off of the Emperor 1510 from MWE Labs in Canada (above). Sold as an "immersive work environment" it ranges from a $5,950 basic model to a $49,150 version with Italian leather and air filtration. Clearly this is an ideal videogaming rig, but at that price I think it would be hard to justify it as anything other than a serious productivity tool. The real key to this story is that we are seeing yet another example of the trend towards unique and innovative collaboration and cloud solutions. Today's programmers are so good, and the software itself has become so advanced and flexible, that it is well within the reach of Sharp to turn a luxury work station into a novel Telehealth solution. It was much harder to re-purpose typical hardware based appliances just 5 or 10 years ago. I expect we will see more and more novel uses of visual collaboration technology, from the hardware and software side, as this trend continues to snowball. The eagle eyes at Ubergizmo�noted that the Sharp solution is based off of the Emperor 1510 from MWE Labs in Canada (above). Sold as an \"immersive work environment\" it ranges from a \$5,950 basic model to a \$49,150 version with Italian leather and air filtration. 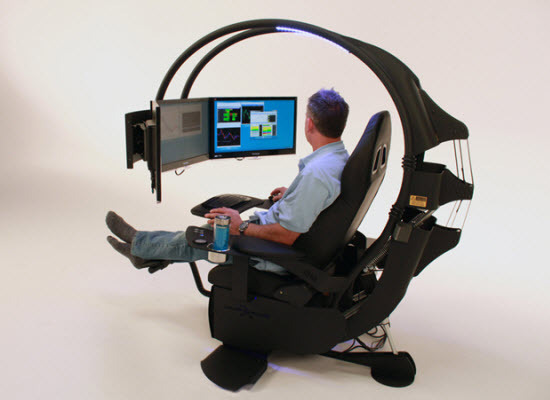 Clearly this is an ideal videogaming rig, but at that price I think it would be hard to justify it as anything other than a serious productivity tool.